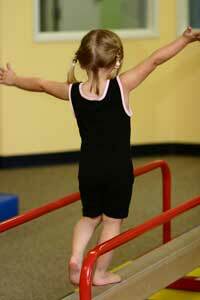 Get kids active by throwing a gymnastics birthday party! Prepare your invitations, decorations, and get ready for a day full of fun! For your gymnastics party invitations, collect pictures of famous gymnasts from sports magazines. Glue them onto folded cards, and write your party details inside. Place the invitation cards into envelopes, and add colorful confetti inside. As a variation, make your gymnastic party invitations look like gold medals. Cut out circles from a cardboard, cover them with gold foil or spray-paint them with gold paint. Attach a colorful ribbon so the kids can wear medals around their necks. Write the party details in permanent felt-tip pen on one side of the medal. Write “Champion” on the other side. Suggest that your gymnastics party guests wear comfortable clothes. Have your gymnastics birthday party decorations in red, blue, and white colors. Tape banners like “Go Canada! or “Go USA!” to the fence. You can also hang medals and prize ribbons from the fence and the trees. Decorate your front door area with paper streamers. Play Olympic music in the background to greet the guests. If you have any gymnastics memorabilia, display it in the party room to set the mood. Hang national flags or gymnastics theme posters on the wall. Fill the ceiling with helium balloons. Spread out any gymnastic equipment or trophies that you have. Cover your gymnastics party table with sports theme cloth. Sprinkle colorful confetti around the table. For a centerpiece, you can use gymnastic baton or sports bottle. Create or purchase personalized “Happy Birthday!” banner and hang it in the party room. *Color Gymnast Station: Direct the kids to an area where you have crayons, pencils, gymnastics coloring books, dot-to-dots, etc. That way you have children occupied until all gymnastics birthday party guests arrive. *Guess How Many: Fill a jar with jelly beans and have the kids guess how many candies are in the jar. Give the jelly beans to a child who can guess the closest to the amount, and give the leftovers to the other players. For gymnastics party favors, hand out sticker sheets, ribbons, pictures of famous gymnasts, headbands, hula hoops, Frisbees, chocolate gold “medals”, yo-yos, body tattoos, etc. At your gymnastics party, you can set up various stations for your guests to demonstrate their gymnastic skills and play at. *Balance Beam: Wrap an eight- to ten-foot length of 2-by-4 board tightly in and old blanket or sheet. Use electrical tape to keep this padding from slipping. Balance the board on a couple of bricks. Have the contestants walk across the board one at a time. Anyone who falls off is out. Increase the difficulty of the walk with each round by having the kids walk sideways, backwards, with their eyes closed, and so on. *Body Mechanics: Design a series of gymnastic events the contestants must perform, such as hopping on one foot ten times, walking ten steps backwards without looking, throwing a ball up in the air while turning around and catching it, and so on. Award ribbons to the best athletes in each event. *Somersaults: Have an area where the guests can do their somersaults. Lay out a blanket or mattress. Have your gymnastics birthday party guests somersault across it. *Jump Rope: Designate an area for jump roping. Get the kids to jump several times before they can move on to the next station. *Gymnast, Gymnast, Sprinter: Have the guests play gymnastics birthday party version of Duck, Duck, Goose. When someone gets tagged and called “sprinter”, that person must get up and chase the player trying to tag her before she occupies the empty spot. *Tumbling Time: Guests must cartwheel, leap, or dance across the area designated for tumbling. Some children might not be as skilled as others – so allow them to be creative and have as much fun as they can! *Hand Stand: Divide your party guests into pairs. One partner has to spot the other as he or she performs the hand stand. Be sure to have an extra helper at this station, so no one gets hurt. *Hula Skills: Have the kids do the hula hoops routine. Use stopwatch to see who can keep their hula hoop in the air the longest. *Pin the Flag on the Gymnast: For this gymnastics birthday party game, get a poster of a gymnast. Mount it on the wall. Draw and cut out national flags (enough for all guests). At game time, blindfold the children, spin them around, and get them to pin their flags close to designated spot on the gymnast (marked with “X”). *Balloon Dance: Attach inflated balloons on long strings to guests’ ankles, wrists and waists. Turn the music on and let the children dance. They must protect their balloons while trying to pop balloons on the other dancers. *Gymnastics Cake: Bake a round cake. Frost it with colorful frosting. Then put gymnast cake toppers (available from a party store) on the cake for a superb look! *Vegetable Tray: Arrange vegetables such as cherry tomatoes, olives, cauliflower, carrots, celery on a tray. Have salsa, humus, or peanut butter for dipping.